Arrive in Vientiane and check in to the hotel, where the rest of the day is free at leisure. You may choose to visit the COPE museum, a not-for-profit organisation set up to provide prosthetic limbs to the many victims that have fallen victim to the unexploded ordinance (UXO) left behind from the Vietnam war. The museum does an excellent job of giving some of the background to the bombing campaign, along with showcasing the important work the COPE foundation is doing. Most report it to be a sobering, emotive but rewarding experience that enhances one's understanding of this fascinating country. This morning we explore some of the main sights including the Victory Gate, the That Luang stupa (said to contain a bone of Buddha) and Wat Sisaket which is packed with fine Buddha images. This afternoon we head out to Buddha Park, a curious green expanse just 30 minutes from the city that houses a beguiling selection of Buddhist and Hindu statues. We make our way to the airport this morning, leaving the Lao capital behind on our short flight to Phonsavan. This region saw heavy and sustained aerial bombardment during the so-called 'Secret War', a campaign that left Laos as the highest bombed nation, per capita in the world. After lunch we head out to the old capital, Muang Khong, passing mainly Hmong and Black Thai villages on the way. Lots of military paraphernalia cluster the villages such as old mine casings and bomb shells which have been turned into flower pots or cattle troughs. Xieng Khouang town was rebuilt in 1975, but we can still see the remains of temples, stupas and French colonial buildings. Today we will explore the 3 sites that make up the Plain Of Jars. Nobody knows how long the jars have actually been here or what they were used for; some speculate they are funeral urns dating back some 2000 years. Another theory says that they were probably made to contain and transport 'Lao Lao', a glutinous wet rice which is boiled with yeast and left to ferment in large jars. It is believed that they were prepared for a huge celebration, which, for some reason was disrupted whilst the jars were being transported, as other jars in smaller quantities can be found on two other sites close by. Despite being one of the most strategic battlegrounds of the Indochina War, most jars were unharmed and remain a complete mystery even today. We spend time discovering the plain of undulating green fields where the 300 giant stones jars are scattered, the largest of them weighing six tons and measuring four metres high. Later in the afternoon we transfer back to Phonsavan, where the rest of the afternoon at leisure. Today is set aside for the long drive west to Luang Prabang. We make our way along winding mountainous roads reaching an altitude of 1500 m at the highest point. We aim to break up the journey with short stops along the way at local villages. The total journey time will be approximately seven hours, depending on local conditions. All the main sights of interest are close together, so this morning we walk around the various wats including Wat Xieng Thong (the Golden Temple built in 1559) which is strikingly decorated in brilliant red and gold designs, with an imposing tiled roof and mosaic dragon motifs. We also include Wat Visoun site of the impressive Thad Makmo Stupa. The afternoon is free and you may like to climb to the small temple on top of Mount Phousi and enjoy the sunset and fine views over the town. This morning we include a trip to the nearby beautiful Kuang Si waterfalls. This afternoon is left free to explore the local area - perhaps by tuk tuk to the nearby blacksmiths village of Ban Hat Hien or the papermaking village of San Khong. Alternatively the craft shops, lively market and eclectic bars and restaurants of Luang Prabang itself are more than enough to occupy those wishing to spend more time in this most popular of Lao destinations. A coffee in a riverside bar watching the world go by can be the ideal way to spend an afternoon. Today we set off by road for the scenic town of Nong Khiaw. The condition of the roads in this part of the country is very much dependent on the weather and we should be prepared for some landslides and delays. The scenery however is spectacular - it's mostly forested with 'slash and burn' cultivation very much in evidence, along with the many hill tribe villages along the way. Slash and burn usually takes place in April and May, when rural fires can be witnessed and smoke can fill the air often drifting into nearby towns and creating a hazy sky. We plan to arrive in Nong Khiaw in the early afternoon where the rest of the day is free to spend at leisure in this sleepy river-side town. Nong Khiaw is a small settlement located upon the banks of the gentle Nam Ou River, overshowed on all sides by towering limestone karts and lush forested hills. This morning we take a longboat upriver to the remote village of Muang Ngoi Neu, where this we will be able to chat to the locals and learn a little about the traditional way of life in this rural part of Laos. We plan to have lunch beside a waterfall, where it's possible to take a refreshing dip in the natural pools there. After lunch we will take to the river again, but this time on kayaks as we paddle downstream back to Nong Khiaw. The total time kayaking will be approximately two hours, and those not wishing to kayak can return to Nong Khiaw by longboat. This morning we board boats for our journey further down the Nam Ou River - south towards Luang Prabang. The river journey is stunning, passing many villages and forests, with the back drop of large rolling mountains. We must leave the boat at Dong Ngern in order to avoid the Nam Ou River dam, from here we continue by road to Luang Prabang. On arrival we board longtail boats on the Mekong River to visit the Pak Ou Caves, where we climb steps up the limestone cliffs to reach the sacred Buddhist shrine. Although now abandoned by the monks, there is an altar for incense burning, flower offerings and numerous rock shelves crammed with thousands of Buddha images of all shapes and sizes. We continue our journey to Luang Prabang, the country's former capital. Today we fly south to Pakse and then take a charter boat down the Mekong onto Champassak district and Don Daeng Island, where we aim to explore typical village life in this sleepy corner of Laos. This peaceful island is located inside the Champassak Cultural and Natural Heritage Landscape, a UNESCO World Heritage Site. We then rejoin the mainland at Ban Muang where we change our transport to a charter bus to drive further south to Don Khong making a stop along the route at Oupmoung Temple. Don Khong is the largest island in the Khong district which is known as the 'Four Thousand Islands' of Southern Laos. It is here, almost on the Cambodian border that the Mekong splits to create a maze of channels and also where the great river reaches its widest point. Exploring by boat and on foot through the watery landscape, we visit some traditional villages of the Lao Loum to witness the daily life of these people. We will also visit parts of the Old French Railway, built at the turn of the century to avoid the treacherous rapids caused by the many channels. Our explorations will include visiting Don Khon Island where we take small boats for possible sightings of Irrawaddy river dolphins. Later in the afternoon we head back to the mainland to visit a part of the Khong Phapheng Waterfalls which is supposedly the widest in South East Asia. This morning we head north again, skirting the western edge of the Bolaven plateau. On the way we stop to visit Wat Phou temple, an impressive Khmer temple dating back to the 6th century and considered to be one of the archaeological wonders of Laos. Originally built at the base of a sacred mountain - a symbol of Shiva to Hindus - Wat Phu became a Buddhist shrine in later centuries. Every February pilgrims from all over Thailand and Laos travel here in their thousands to celebrate the full moon festival and participate in various local competitions. At this time Wat Phu becomes decorated by offerings left to appease the earth spirit of Champassak. From here we continue our journey east into the heart of the Bolaven Plateau. Here the soil is very fertile and so cultivation of Arabica & Robusta coffee and tea is the most important trade, which is complimented by small scale agriculture of fruit, vegetables, cardamom and rattan. We plan to arrive at the hotel in the late afternoon, with some free time to relax or swim in the natural pools by the waterfall. Day 14 - Walk across the plateau and visit coffee plantations. Free time at Tad Fane waterfalls. We set off this morning for an easy walk through the lush forests and coffee plantations that the area is known for. As we walk we hope to get a glimspe of the coffee farmers at work and learn about the cultivation process used here. We'll pass a number of limestone formations before stopping for a picnic lunch with scenic views over the Bolaven plateau. We end our walk at the towering Tad Fane Waterfalls. With a drop of 120 metres, the twin falls of Tad Fane are the highest and Laos, and easily the most impressive. The total walking time today is around three hours and is graded as easy. This evening we plan to visit a local homestay in a nearby village for our final group meal. 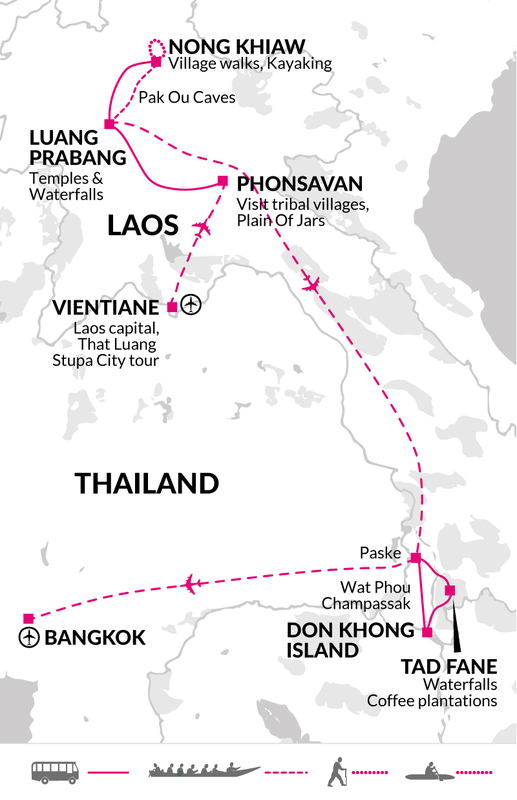 We leave Laos behind this morning, driving first to Pakse before catching a flight into Thailand's capital, Bangkok. The afternoon has been left free for exploring this frenetic city, or perhaps for some last minute shopping for souvenirs at one of the city's many markets. Trip ends this morning after breakfast. This fantastic tour is a real in-depth look at Laos, one of Indochina's most charming and least visited destinations. 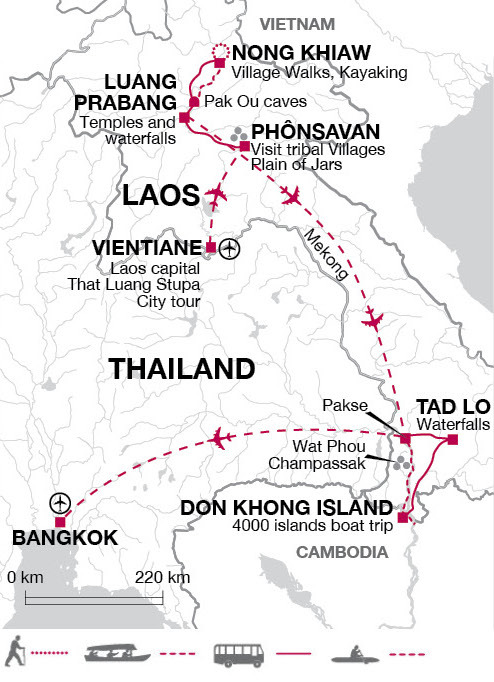 The tour is designed to take you beyond the main visited cities of Luang Prabang and Vientiane. You will see more remote parts of the country such as Phonsavan and the 4000 islands region deep in the south. The tour also gives you the chance to sample a little of Bangkok too.